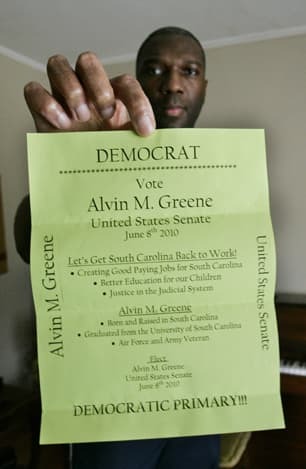 Here is the campaign flyer that Alvin Greene distributed in campaigning for his primary win on June 8. Alvin is now running against incumbent Republican Jim DeMint in the race for U.S. Senate for South Carolina. On the face of it, it is very succint with excellent bullet points. Let's Get South Carolina Back to Work! Were Russian Spies in Cambridge No Way Outed? Is Alvin Greene a Plant for the Hatfield Clan?